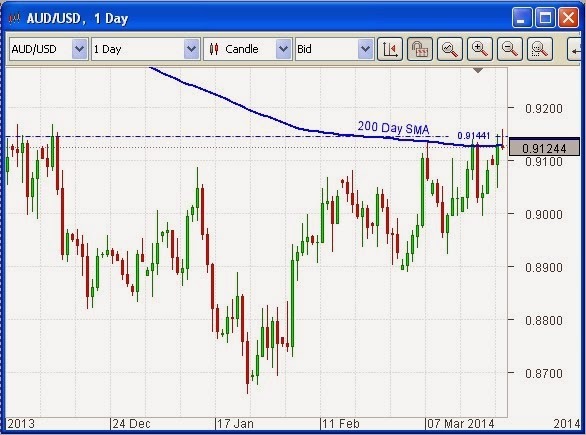 OmiCronFX : Good call on gold | Has the Aussie peaked for now? 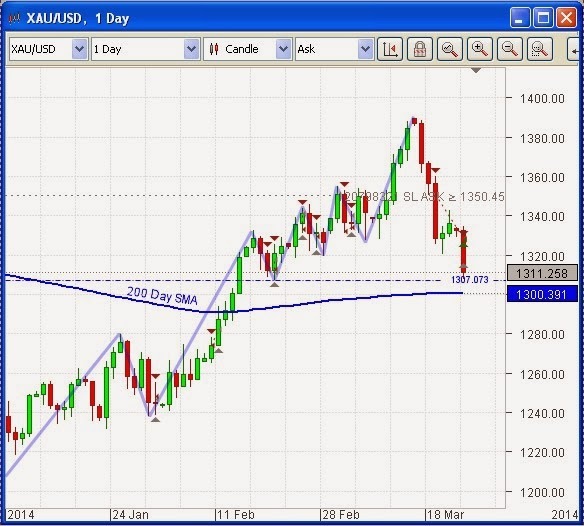 Good call on gold | Has the Aussie peaked for now? Our analysis of gold in yesterday’s commentary (The outlook for gold) called for it to fall and, sure enough, at the start of the New York session later in the day (GMT), that is exactly what happened. Our short trade quickly reached the level of better than 2% of equity in profit. We took off one half of the position at that stage and moved the Precautionary Stop Loss to Break-Even. This practice locks in profit and gives us a free trade on the balance of the position. Now gold is approaching not one, not two, but three areas of price support which are effectively confluent. This makes the level at which they occur stronger than would otherwise be the case. One is a swing low support, at 1307 dollars per Oz., another is the 200 Day Simple Moving Average (SMA), which just happens to be almost exactly at 1300, and the third is the fact that 1300 is a nice round number. Support and resistance will often be found at round numbers. We can therefore expect to be held up here in our anticipated journey to a lower price for gold. As noted, we have taken something off the table and moved the Stop Loss to a position that ensures that, even in the event of a complete turnaround, this trade will show a profit. Has the Aussie peaked for now? Interestingly, the Aussie (AUDUSD) is in a somewhat similar position, coming from the other side. It is butting up against the 200 Day Simple Moving Average (SMA) too, but in this case as resistance, which now coincides with a resistance level that dates from late last year and which price has failed to break on a number of occasions recently. Unlike gold, however, in this case we believe the balance of probability is on a reversal. This is due to the fundamentals of the stated desire of the Australian authorities to reduce the value of their currency, as well as consistently soft manufacturing and other economic data coming out of China, Australia’s largest trading partner. The tapering of QE in the US should also tend to strengthen the other side of AUDUSD, the US dollar, and contribute to a lowering of this pair. We do not rush in though. That is not our way. We have set the Mandelbrot algorithmic routine against the Aussie / US dollar pair. It will wait for a clear signal giving confirmation that price has indeed turned down before it will consider taking a position. Then, as usual, it will invoke all of the risk control, capital retention and trade management principles that have been programmed into it.